Scroll down to view the latest images of the lakes. 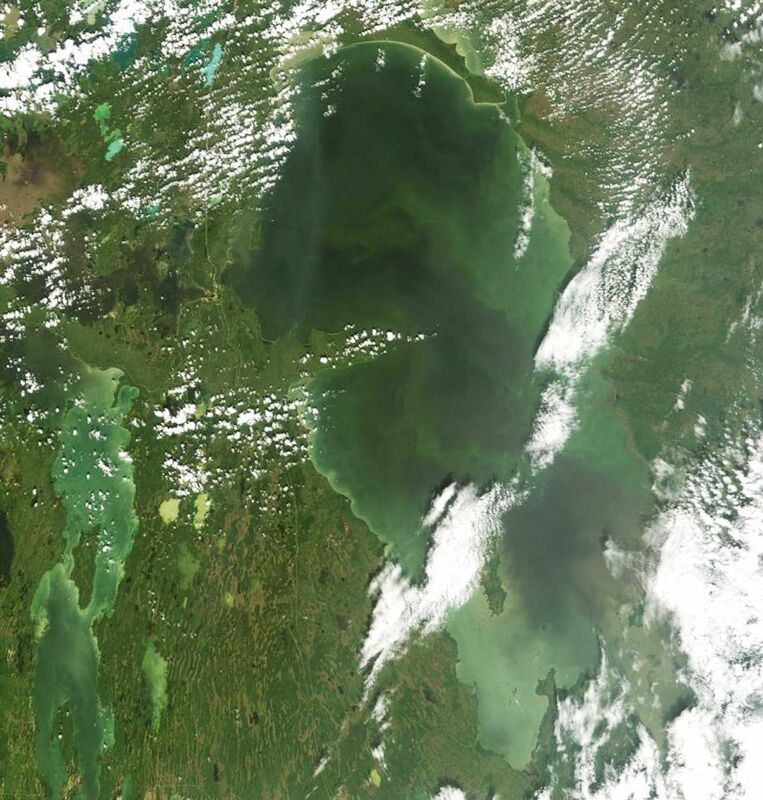 You can go back in time a little by clicking on these links to earlier images of the lake – summers of 2003, 2004 and 2005 – pictorial records of summers of intense algal productivity. at the other end of the size scale. The site is operated by Noetix Research of Ottawa, and displays maps created using algorithms that I have developed in cooperation with the Department of Fisheries and Oceans. It will be updated with new maps weekly, or as often as cloud-free satellite images are available. The service is funded by the Canadian Space Agency and for the next couple of years at least, is completely free to users. Disclaimer: These pages were originally begun for the convenience of members of the Lake Winnipeg Research Consortium in planning scientific missions. Although the content and opinions expressed herein have been formed at least partly in the course of many conversations with Consortium researchers, and with others, I am solely responsible for all the words – whether interesting, helpful, inciteful, misleading or possibly just plain wrong. (Well, not for the microphotography in the linked pages – those are all Hedy’s work.) If any of the images on these pages bring to mind thoughts, ideas, questions, whatever – email them to me if you like, via my email address above. Unless I’m inundated, I’ll try to answer; I seem to be endlessly fascinated by these lakes. They are RGB colour composites of MODIS 250-m resolution data with Channel 1 (670 nm) displayed as red, and Channel 4 (565 nm) as green and Channel 3 (479 nm) as blue, i.e. approximating colour as people perceive it, except with the colour contrast a bit exaggerated. The brightest greens in the water in these images are indicative of algal blooms (see for instance the bright greens at the north end of the lake in this image recorded on the 3rd of August 2004) but a bit of "greenness" is not necessarily due to algae at all. 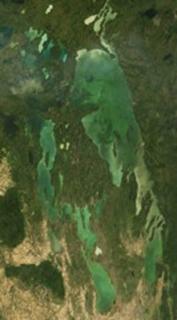 That's because as the lake varies from clear thru low to moderate to high mineral sediment concentration, the change in relative spectral attenuation of light in the water column causes reflected colours to shift from dark blue-black (clear water, most of the incident light absorbed, only a bit of blue reflected) through darker blues to green to the greenish-browns and tan (turbid water, reflecting a wide mixture of colours, "brownish" to our eyes). The first surface blooms of summer are starting to develop now – look for the very bright yellow-green in the North Basin, south of Long Point and just to the left of the clouds on the 22nd of July, above. 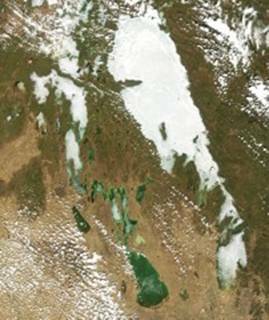 Judging by the widespread green covering most of the eastern half of the North Basin on the 19th, extensive surface blooms will probably develop there in the next few days – if it remains as hot as today – in the mid-30s (Celsius) and the lake is calm enough. 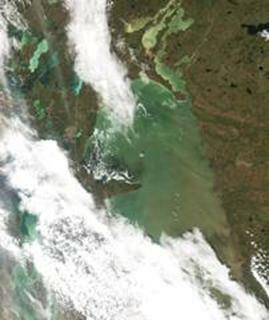 You can see bright green in the more turbid water in Fisher Bay in the Narrows region, and along the east shore of, and to the north of Grindstone Point. A lot of ice has disappeared from the South Basin over the last couple of days. Its been warm, but not especially warm. Wind was surely a bigger factor. We’ve had NW and NNW winds up to 30-45 km/h a few times over the last few days – a few gusts over 60 km/h. The winds probably explain the muddy water along the SE shore of the South Basin, too – muddier than we might have expected so soon after the ice broke up. What’s left in the South Basin looks really rotten; it will go quickly. The winds had an effect on the North Basin, too. Still lots of ice there, but leads have opened up where wind-shifted ice came up against islands. That’s what would have created that great open lead from the end of Long Point to the east shore. It follows a winding path, but that path goes right through Sand and Georges Island out there in the centre of the basin. Ice to the north was too solid to be pushed south through the islands, but there must have been enough open water and weak ice at the south end so that everything south of the islands could be shifted a few kilometres by the wind. And so a great crack opened up right across the lake. There must have been some great grinding and cracking to be heard. 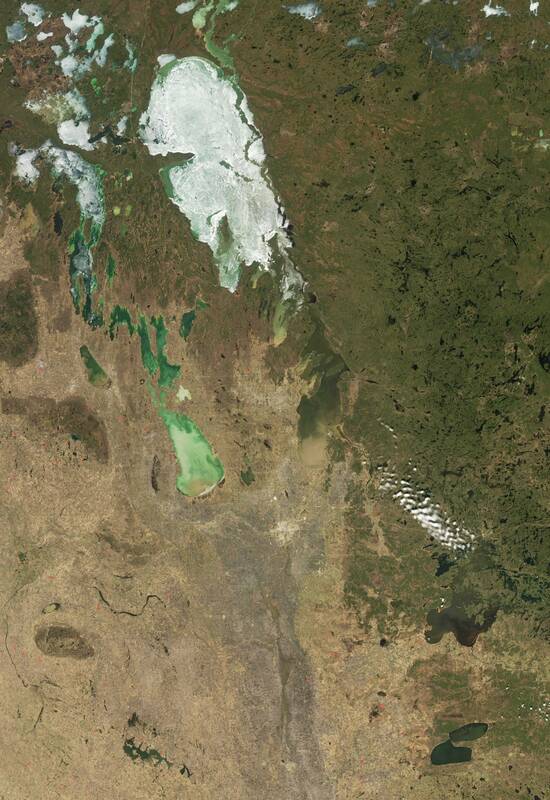 Breakup of the ice cover on the South Basin started in earnest this week. It’s a little later than in last year and the year before – in both 2005 and 2006 the South Basin was open by the 24th of April (scroll down to the bottom of this page for some images). On the 24th this year (image on the left) the only open water visible was a patch a few kilometres wide at the south end, where the Red River has been flowing in for the last couple of weeks, and another in the channels on either side of Black Island. These open early because relatively strong currents there melt the ice from below, thinning it so that it melts earlier than in the open lake. But by today, the 29th (centre and left images) there was lots of open water: most of Traverse Bay at the mouth of the Winnipeg River, a wide lead along the west shore from the Red River to Hecla, and in shallow bays, like Washow and Fisher Bays, along the west side of the Narrows region. 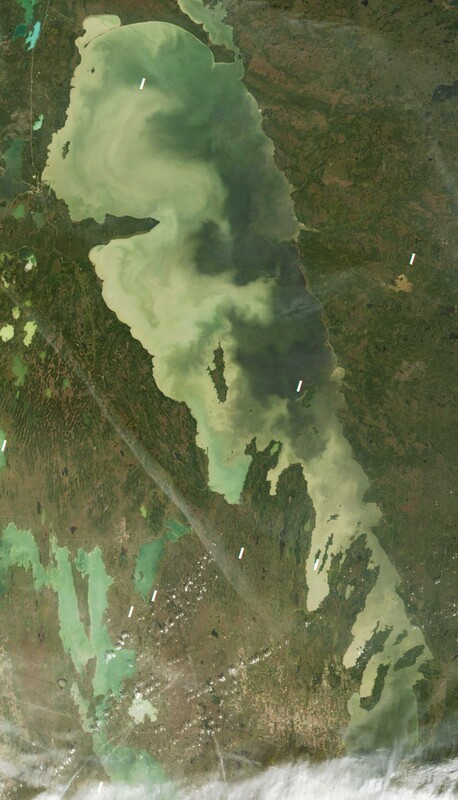 There’s quite a bit of open water around the outlet, too (near Warren’s Landing) – and a bit around the mouth of the Saskatchewan. 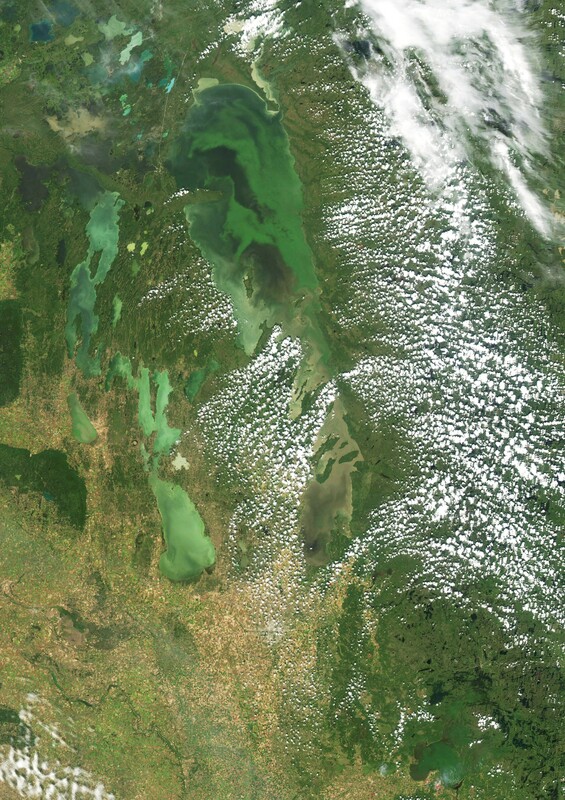 And most of Lake Manitoba opened up over the last few days. Only some really rotten ice left in the middle of the South Basin. So another open water season begins. 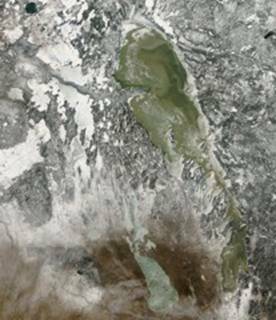 By the way, if you look carefully at the shape of the western boundary of the new ice in the North Basin on18 November, you’ll see that it matches the shape of the west shore. It looks to me like the first ice formed along the shore, but was torn free by westerly winds to create a 10-km broad open lead. By 25 November, the western edge of the ice sheet had been carried another 10 km to the east, to where it now sits locked in place by new ice stretching right across to the east shore. The narrower lead along the west shore of the South Basin probably has much the same history. The colour of Lake Winnipeg was dramatically changed last week. Sustained northwesterly winds blew in excess of 40 km/h most of the 12th and 13th, and remained high for several days after. Silt and clay from shore erosion and bottom resuspension has turned the South Basin a deep, rich brown – only just distinguishable (in colour, though obviously not in texture) from the fallow land to the southwest. 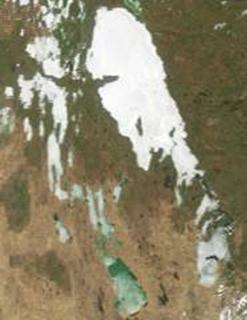 (And much of the land to the southeast of the South Basin is snow-covered – snow that developed from water taken from the lake as the winds passed over it.) 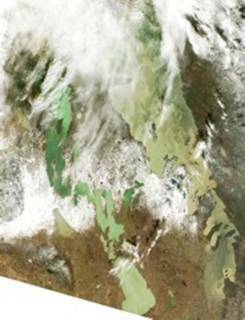 Most of the North Basin is a smooth pale brown – rich with silts and clays, probably eroded from the bottom in shallower regions in the western part of the basin and spread widely across the basin by currents developed as the lake’s surface was tilted by the winds. 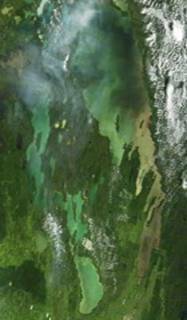 Some of the greenish bits – those along the north shore, and along the south shore of Long Point – both in the lee of the winds – suggest that deeper water has upwelled to replace the surface waters carried southwards by the winds. Rather than show you the wind record (you can find it at http://weatheroffice.ec.gc.ca/canada_e.html), I have copied some water level charts from Environment Canada’s hydrometric archive (http://www.wsc.ec.gc.ca/products/main_e.cfm?cname=products_e.cfm) – see below. On the night of the 12th/13th, the level dropped roughly 0.6 m at Montreal Point, near the north end of the lake, and rose 0.5 m at Berens River, near the south end of the North Basin. It peaked a few hours later at Pine Dock in the Narrow, and then, of course, continued to flow southward into the South Basin – causing a peak almost a day later at Breezy Point at the south end of the lake. Most of the South Basin was raised over 2 m in the 4 days from a low on the 10th to a peak late on the 13th. The last rapid rise, roughly 1 m on the 12th and 13th, (averaged between Pine Dock and Breezy Point) carried over 3 cubic kilometres of water through the Narrows in roughly 20 h – that’s over 40,000 cubic metres per second. For comparison, that’s 10X the highest daily mean flow in the 1997 flood. There must have been very strong currents passing through the channels around Black Island – you can see lines of flow preserved in the coloured bands of water stretching south from these channels. Small wonder that in one of them – the eastern one – is the deepest hole in the lake. Two images from this week, with enlargements of the South Basin, below. For local readers: there was a mention of the fire near St. Ambroise, in the marshes at the south end of Lake Manitoba, in this morning’s Free Press. You can see the smoke at the bottom of the image on the right. South Basin on 1, 3 and 5 October 2006: Al Kristofferson told me that the Namao ploughed through thick algae in traversing the South Basin on the 3rd of October, and where it appears through the clouds, it is indeed quite green looking on the 3rd – indicating a surface bloom. 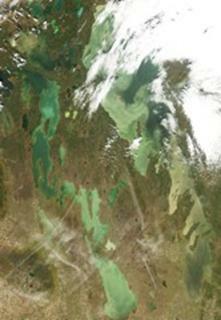 Most of the basin is relatively dark in the other two images above, the 1st and the 5th, indicating relatively clear water, but not showing much algae. I included another graph of winds that helps explain the apparent change. High winds on the 1st and 5th have mixed the algae down into the water. They are still there – as they have been since early August – but not so apparent on these images. Surface blooms quickly develop and disappear depending on whether turbulence in the water column lets them rise to the surface, as bluegreen algae will do when they have the chance. Strong northeasterly winds (sustained winds of 25-35 km/h over several days, blowing mostly from 50-70o azimuth – see the chart above with data from the Environment Canada weather station at Grand Rapids) two weeks ago must have disturbed the western side of the North Basin to the bottom – stirring bottom sediments up into the water column. 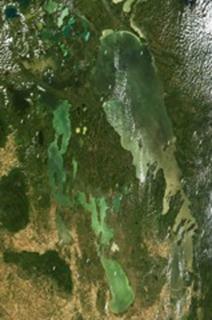 Compare the broad light tan-coloured region north and south of Long Point in recent images above with the colours in the image below (10 September). Surface blooms of algae formed up all along the eastern side of the North Basin on the 20th -- where the water was relatively clear of suspended silt and clay – i.e. where it could grow and reproduce in the deeper sunlit layer of water. In contrast, no surface blooms are apparent in the very turbid water on the west side. Although surface blooms in the South Basin are not so intense as earlier this summer, there was still a lot of algae in the water there last week – much of the basin is still pretty green. Some of you may have seen the pictures below. They were taken on Grand Beach – along the east shore of the South Basin – in early August, when one was published in the Winnipeg Free Press. The photographer, Lori Volkart, kindly offered to let me show them on this site. 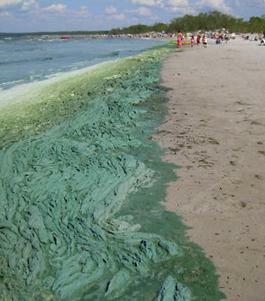 Blue-green algae washed up on Grand Beach, early August 2006. 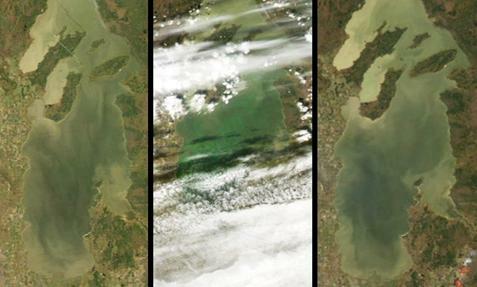 The widespread surface blooms of blue-greens that so coloured the lake on the 3rd and 4th are not apparent in these images. Still, there is a lot of green in the water. In much of the South Basin, the water looks pretty clear (dark, in these images) – but there is a greenish tinge in the darkness. Whether surface blooms re-develop really depends on the weather now. If we slip into warm autumn, and relatively calm, then surface blooms could still form up; they’ve formed as late as early October in previous years (e.g. see the middle image in this set: 27, 30 September & 6 October 2004). The surface blooms of algae in the image of the 3rd of September are the most widespread that I have seen in Lake Winnipeg. 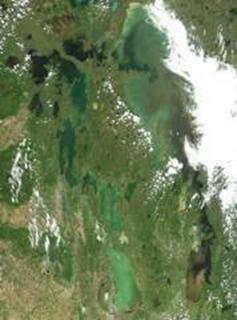 A large portion of the North Basin is green with algae – as extensive, though perhaps not quite as intense, as last year on the 29th of August . 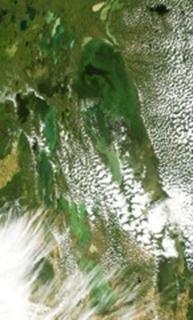 Once again – as in the images from mid-July – see 15 July 2006 – there were intense blooms in the Narrows region as well. However, this year much of the South Basin is green, too. 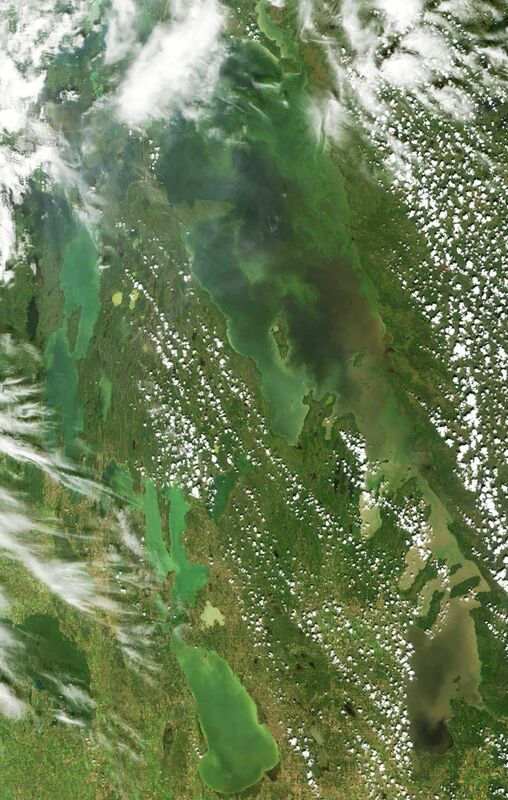 For the first time – at least in recent memory – people who go out on the South Basin are seeing widespread algal blooms in something approaching the concentrations that people who fish the North Basin have seen for the last decade or so. 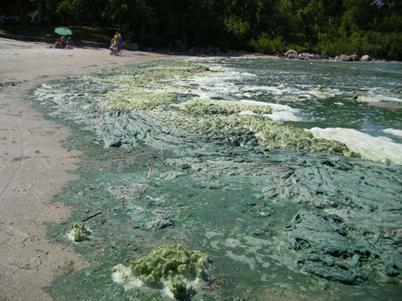 There were reports of algae washing up on some of the cottage beaches over the Labour Day weekend; these images show that these were not isolated events due just to the vagaries of the wind, but rather, symptoms of a widespread phenomenon. 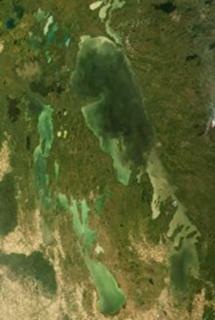 On 3 and 4 September the South Basin was green, from the mouth of the Red River up to Hecla Island, and from near Gimli across to Grand and Victoria Beaches, as well as all up the east side from Traverse Bay almost to Black Island – most of the basin. 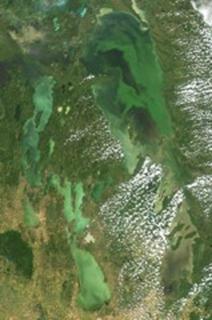 This summer may have seen a perfect confluence of events to promote growth of the blue-green algae. Last year, high runoff from the Red River carried through beyond the usual spring peak into the summer. Widespread flooding charged the flow with extra nutrients dissolved from vegetation that was inundated through most of July. 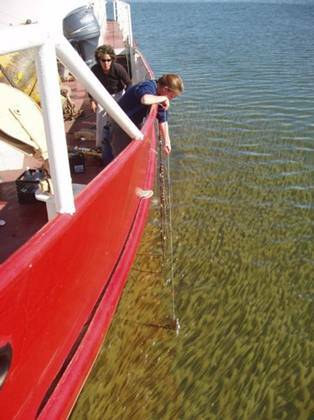 This year, an early break-up was followed by warm spring and early summer temperatures that fostered algal growth. And then there was the relatively clear water that we saw in the South Basin. The last is a factor that usually distinguishes the North from the South Basin. Light penetrates more deeply in clearer water – providing a deeper layer through which algae can grow and reproduce. In much of the North Basin, that layer is typically several metres deep – and it is in this deeper photic zone that the great surface blooms of the last decade have formed. In the more turbid South Basin light penetrates often only a few decimetres – reach into the water to your elbow and you cannot see your hand. But last weekend at Gimli and Hecla, you could see the bottom down to a metre or more. In late July the Red River was flowing relatively clear -- carrying less than its usual load of silt and clay – and water in the south was unusually clear for the time of year – see 24 July 2006 and the accompanying discussion below. 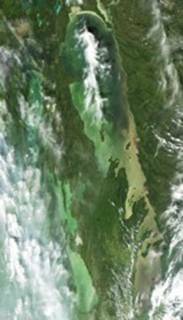 The result is the most widespread bloom in the South Basin in over two decades of satellite records. 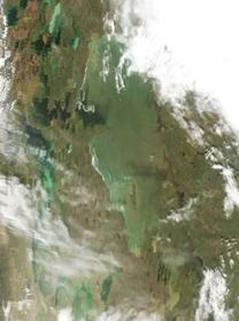 The bright green that covered much of the North Basin appears much more muted in this image. 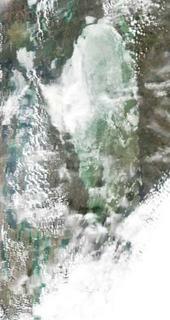 Similarly, the green patches in the South Basin in the images below have all but disappeared in this image. 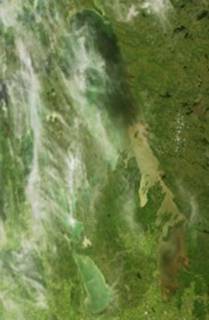 Although I haven’t checked the weather record, it is likely that winds have mixed the algae down through the water column, making them less visible to the satellite. 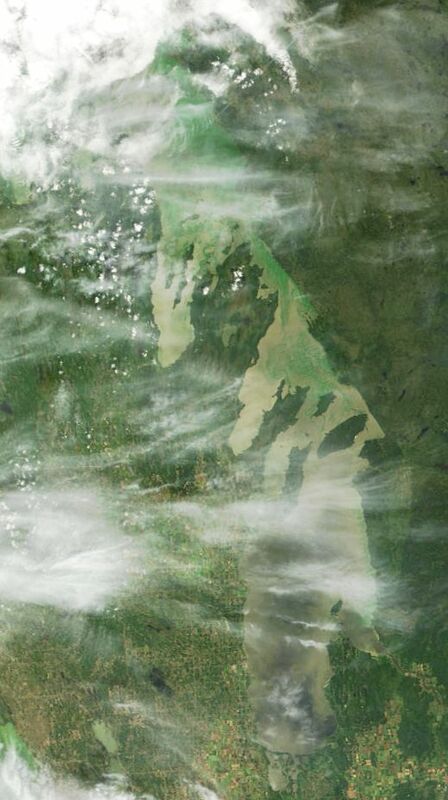 In the images above, you can see very widespread surface blooms that developed in early August and persisted at least until the latest good image I have seen – on the 19th. Although it’s not the largest in the last few years, its still a very widespread bloom. On the 18th floating mats of algae covered more than a third of the surface area of the North Basin, or easily 6-7000 km2 of the lake’s surface. 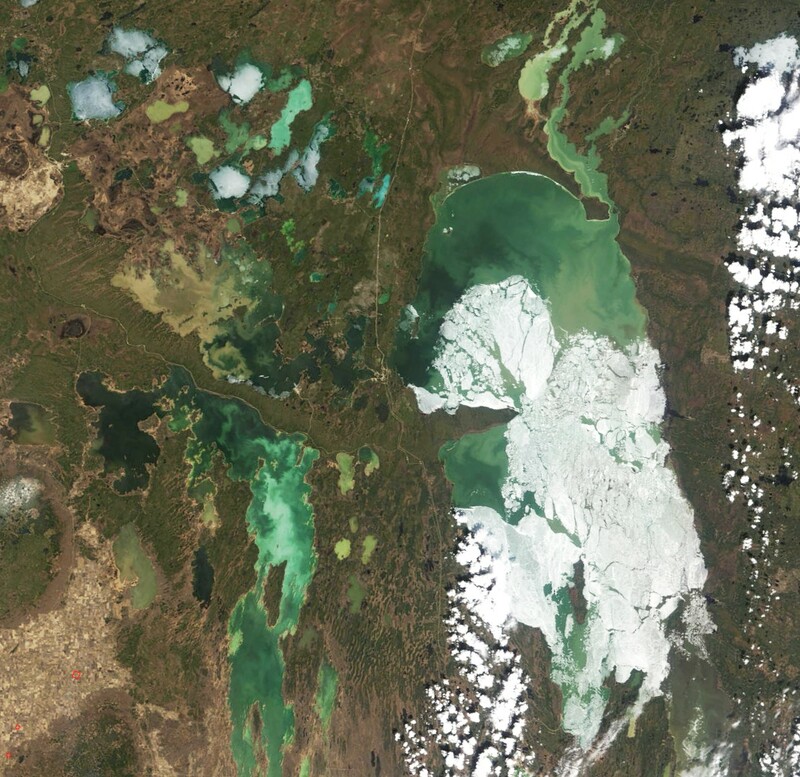 As has been the case in the last few years, these really widespread blooms have developed most consistently in the relatively clear waters north of Berens Island – that is, north of the more sediment-laden waters (browner, in these images) in the South Basin and the Narrows region. Strong surface blooms did form in the Narrows earlier this year (e.g. 15 July 2006) and they are still apparent in the 7 August image, but they are not so apparent now. 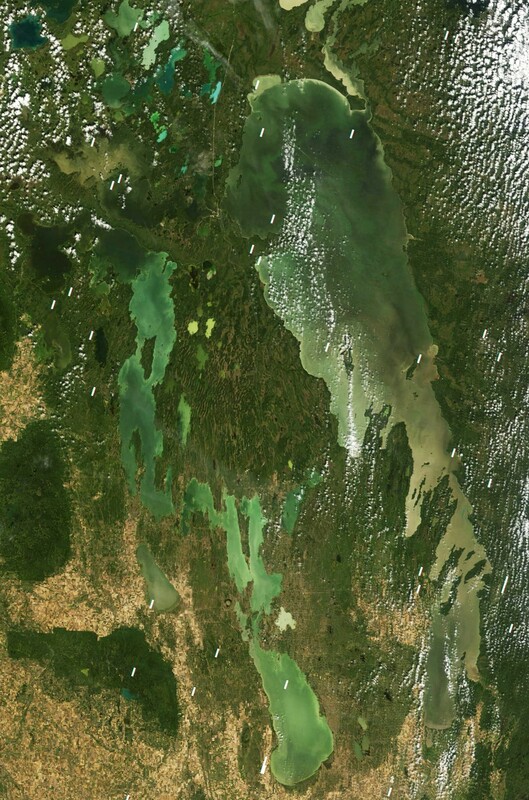 What is also apparent is that strong surface blooms did form up in early August in Traverse Bay, in the South Basin – I’m sure the cottagers there are well aware of that. And if you look closely, there are green patches between Gimli and Grand Beach that indicate that algae have been pretty productive in the South Basin, too, though their presence is partly masked by the turbidity of the water there. 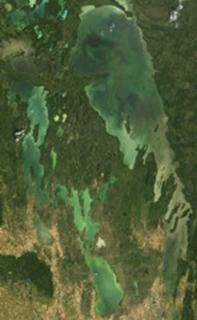 For those who are interested, I have also included an image of Lake of the Woods is included on the 7th August image. Through the last decade, Lake of the Woods has also been plagued by intense surface blooms of cyanophytes – blue green algae. In early August, intense surface blooms covered most of the large southern basin of the lake, Big Traverse Bay, and reached up along the west side almost to Kenora. 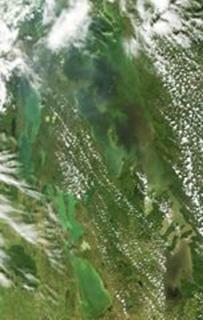 The lake was mostly obscured by cloud on the 29th of July, but you can see in the image above that there were surface blooms of blue-green algae in the Narrows region. 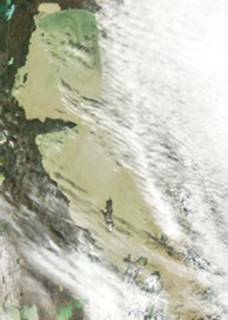 However, a couple of days later, on th 31st, the greens in the North Basin were muted compared to the image recorded on the 24th (below). It is likely that in the interim the algae were mixed back down into the water column by winds and waves. The surface blooms of algae that first appeared ago just north of the Narrows a couple of weeks are still quite distinct in this image. Plus now there are widespread blooms around Grindstone Point – a large cottage community near the north end of the South Basin. And now distinct surface blooms are appearing in the North Basin -- very widespread, especially from just north of Georges Island to the outlet at Warrens Landing, and over much of the region north of Long Point, though their full extent is obscured by cloud in this image (but covering easily more than a quarter of the North Basin – that is, more than 4000 km2 of dense algae and the summer is still young). 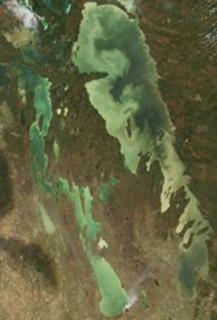 The pattern of clear water (relatively dark) along the north shore of Long Point, together with the clear water off the tip of the point, is very reminiscent of last year – see the 29th of August last year – when a similar pattern seemed to have been created by the spreading of relatively clear Saskatchewan River water first south and then back north as the flow passed beyond Long Point. 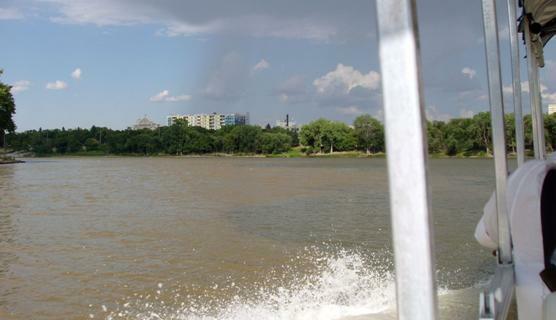 I have added a picture taken from the Water Bus at the Forks in Winnipeg showing the much muddier Assiniboine River water mixing with relatively clear Red River water. There is still a strong current in the Assiniboine – consequently it is still carrying a lot of silt and clay eroded from its banks and bottom. But the Red is clearer, perhaps because it is not flowing as strong, or perhaps because the floods of last summer scoured and carried away a lot of the most easily erodible sediments along the channel. In any case, it is this clearer Red River water that is making the southernmost end of the lake very clear. 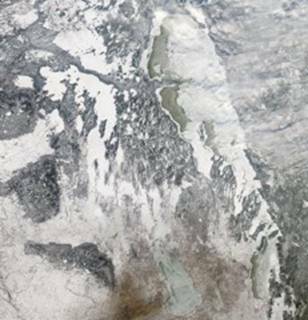 This impression from the satellite images was confirmed to me last week by a cottager from south of Grand Beach, who remarked on the unusually clear water there. 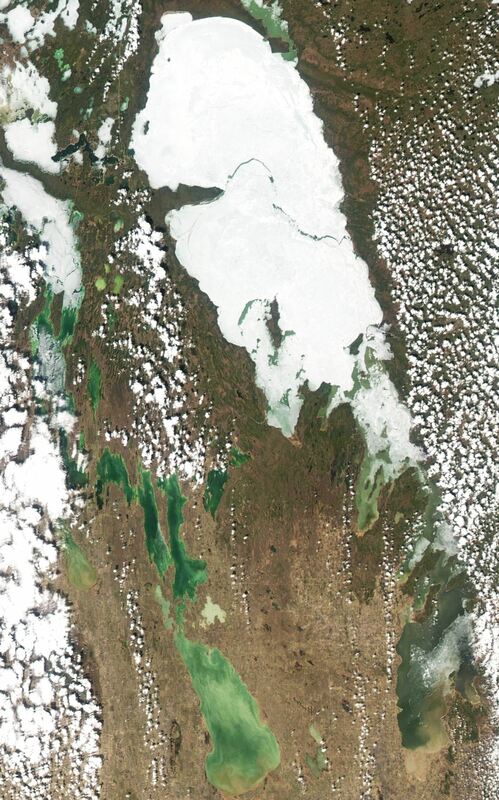 Widespread surface blooms don’t appear to have developed yet in the North Basin of Lake Winnipeg, although there may be a little more there than meets the eye. The colours are muted – that’s due to a bit of haze in the atmosphere – so some of those greens might look quite a bit brighter on a good, clear day. 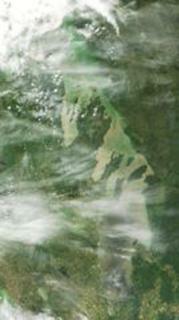 (For instance, look at the irregular green patch just north of Georges Island.) Nonetheless, even by early July (see the 10th, above) there were local surface blooms of algae along the east shore just north of the Narrows. These became quite intense by the 15th – you can see the southern edge of these blooms above, with the northern limit obscured by cloud. They’re still there on the 20th, though not as widespread or intense. But the differences from day to day can easily be a function of wind and waves – if there are enough blue-green algae in the water, surface blooms will appear whenever by developing buoyancy (charging internal vesicles with gas) they can overcome the mixing energy of rough water. 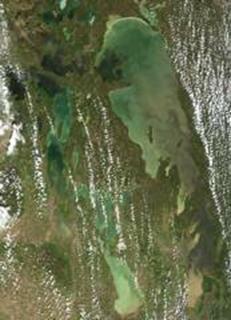 If you look closely, you can also see a narrow bloom along the east shore of the South Basin, east and northeast of Elk Island – its readily apparent on the 15th, and I think there was still a bit of a bloom near the north end of Traverse Bay on the 20th – just visible through the clouds. 12:35 27 June 2006 In late June we were getting a lot of smoke from northern Saskatchewan down here. You can see the path on one day, the 27th, above. Lake Winnipeg is at the lower right of the image. 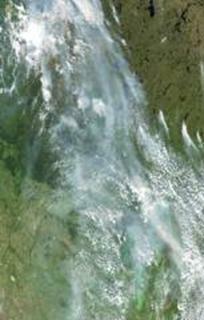 The thickest plume of smoke is passing right over the North Basin – coming down from fires west of Reindeer Lake, near the upper left of the image. 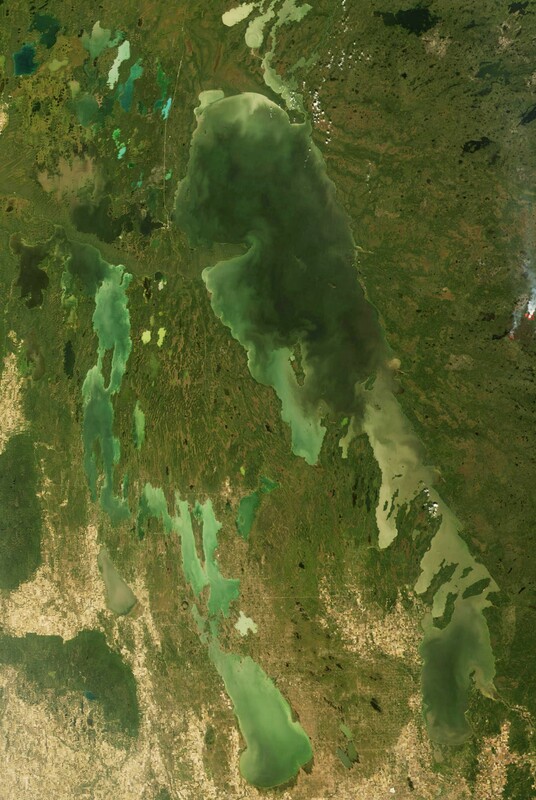 Left: The west side of the North Basin is becoming quite green – at least partly due to algae in the water column, but no where near the colour of surface blooms that develop later in the open water season. The plumes of the major rivers are very obvious in these images, especially in the South Basin in the contrast between the tan colour of Red River water (muddy, turbid) and the dark of the Winnipeg River (clear, absorbing most of the light falling on it). 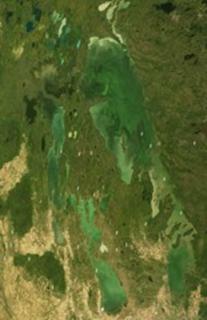 Saskatchewan River water is still relatively clear compared to the surrounding North Basin water. And in this image the Fisher River (at the south end of the large bay along the west side, in the Narrows region) is flowing in particularly red-brown, something I haven’t noticed before. The red brown colour is due to dissolved organic matter from wetlands in its watershed. 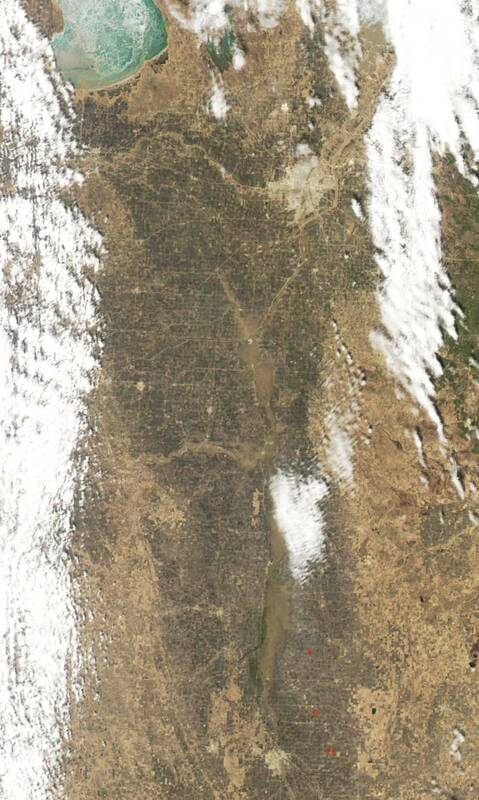 Right: You can see the immediate effects of two of the major inflowing rivers in the image on the 17th. 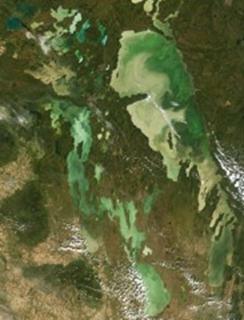 The southern half of the South Basin is marked by the silt- and clay-laden waters of the Red River. The northern half is still relatively clear; most of the silt would have settled out in the calm water under the ice through the winter. 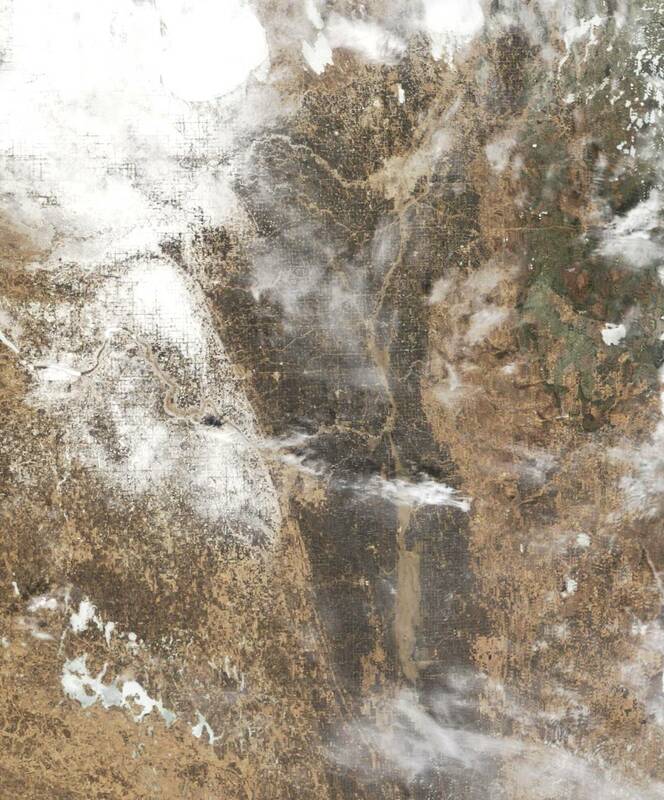 And the plume of the Saskatchewan River spreads out into the North Basin. 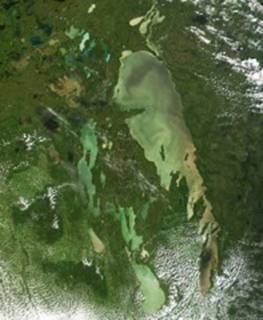 It is clear, and relatively dark in this image – clear because Cedar Lake just upstream of Lake Winnipeg acts as a sediment filter – most sediment settles to the bottom there before the flow reaches Lake Winnipeg. The plume of Saskatchewan River is often quite striking. Here it is spreading broadly out into the lake; later in the summer it is more likely to be seen spreading eastward along the north shore of Long Point (e.g. 29 August 2005). 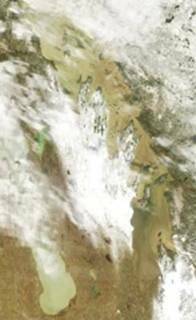 It’s not easy to pick out the ice from amongst the clouds, but the ice on the North Basin was well on its way on the 30th of April. You can see lots of open water up to George Island, and further north, where there was still widespread ice, it looked pretty fragile. By last Friday, there was only a little ice left, and today – only fragmentary floes along the west shore. 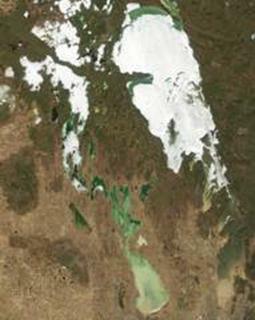 Break-up on the North Basin is happening a little earlier than last year – when it was still half ice-covered on the 5th of May (2005) – and a lot earlier than 2004, when there it was still half-ice near the end of May (2004). 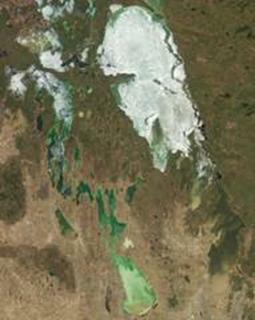 Even in 2003, when the lake was unusually warm later in the summer, the ice was solid over the North Basin in the 6th of May (2003). On the 21st, only southeastern bits of the South Basin (see the enlarged South Basin images below), the Narrows and shallow bays just west of the Narrows are open, but the ice cover on the North Basin looks pretty solid. 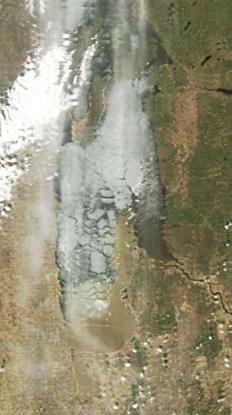 Already, by the 24th the South Basin was completely clear of ice. 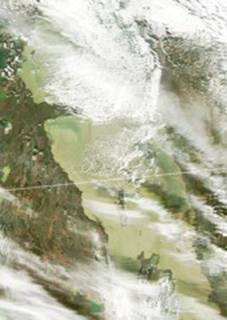 Winds over the lake blew NNW at 20-40 km/h from early on the morning of the 23rd, through the night and into the 24th – by which day broad patches – 5 to 10 km wide – had opened up at the north end – along the north shore and south of Long Point and Reindeer and Berens Islands. (See more on the effect of these winds, below.) I’ve kept much of the Red River valley on the larger image on the 24th – flood waters still cover a wide expanse near Morris on the Red, and further south in North Dakota. Today, the 26th, a wide lead has opened up along the length of the east shore of the North Basin, not quite onshore, but rather, paralleling the edge of deep water. The pattern of ice still attached to the east shore is pretty much the pattern of shallow water with numerous reefs at and just under the surface – especially the broad bulge in the shore-bound ice stretching 15 or more kilometres lakeward off the mouth of Poplar River, directly across from Long Point – a place we never go in the Namao, called “foul ground” on the navigation charts. And something I didn’t notice yesterday – a tiny crescent of white (tiny in these images, but at least a couple of hundred metres wide along the lakeshore) bordering the little bay just south of Victoria Beach along the east shore of the South Basin – the NNW winds must have piled ice high against the shore there, at the little cottage community of Hillside Beach. 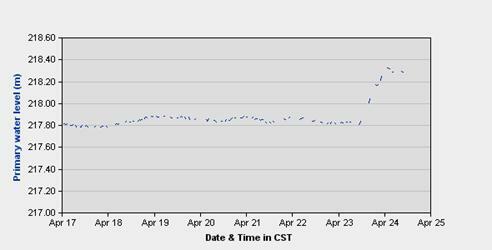 Water level at Gimli (compliments of Water Survey of Canada -- http://www.wsc.ec.gc.ca/products/main_e.cfm?cname=products_e.cfm). The level rose 0.5 m from noon to just after midnight last night. That means a lot of water was pushed south through the Narrows. 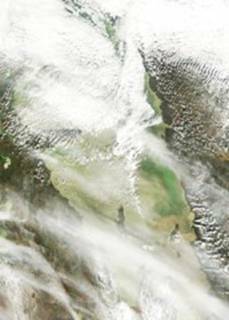 If you look closely at the enlargement of the South Basin below, you can see a plume of greenish water pushing southward into the South Basin through the gap between Hecla and Black Islands – one visible sign of the flow that passed through that gap last night. 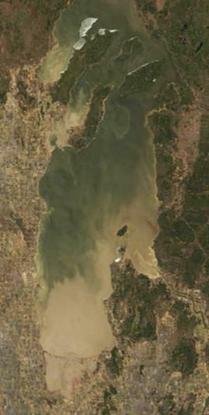 All of the south end of the South Basin is turbid – muddy brown coloured. Some of that is the muddy Red river water, but the muddy water in Traverse Bay must be due to erosion and resuspension of bottom sediments. Not from the Winnipeg River, at any rate. It flows clear – see how dark (clear) Traverse Bay is in all the earlier images. 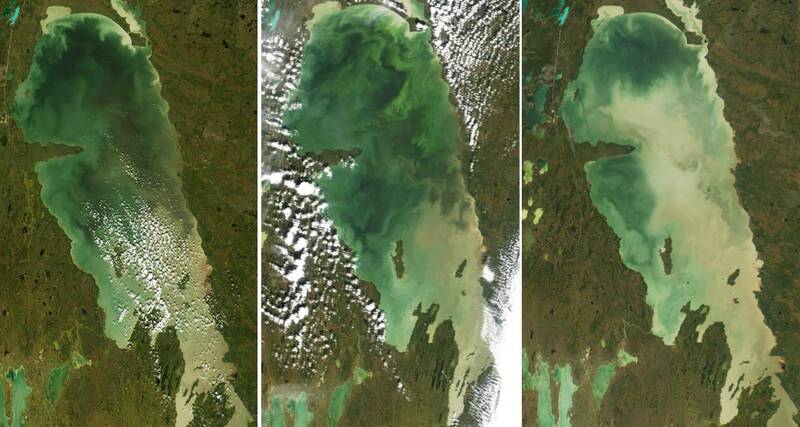 Four images of break-up on the South Basin of Lake Winnipeg. 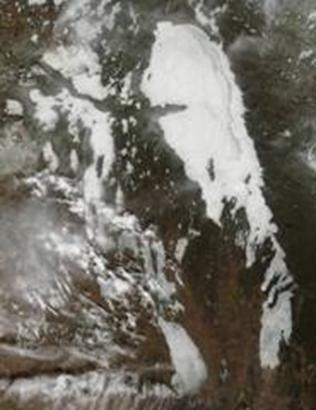 The period of breakup was almost the same as last year – the 16th to the 23rd of April, last year, from first open water to last ice – South Basin 16, 18, 19, 20 & 21 April 2005. Last year was the earliest on record that the South Basin was ice-free – this year must be the second earliest. Melt on Lake Winnipeg is just beginning in this image (South Basin enlarged on the above). The light tan colour a the south end of the South Basin is muddy Red River water – mostly filling the Netley marshes, but also melting out into the lake itself at the mouths of two inlet channels. 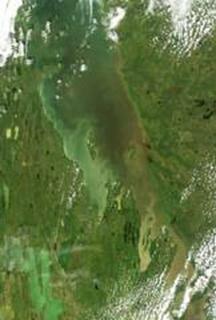 There’s some open water around the mouth of the Winnipeg River, too – darker in this image, and therefore clearer water. 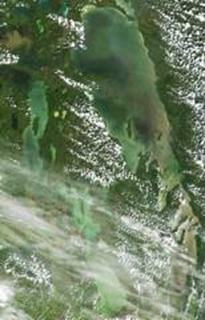 And there are open leads among the islands – a mile wide at least between Hecla and Black Island near the top of the image. 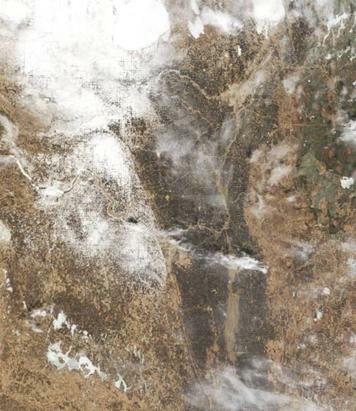 The image on the right shows the Red River valley on the 8th of April. The valley itself is easy to pick out – it’s the broad dark band running up the centre of the image – black fields. The grid through the fields is the section lines – each pair 1 mile apart – giving you the scale of the image. Winnipeg is the very light tan near the north end of this dark band – at the confluence of the Assiniboine from the west and the Red from the south. Rivers are light tan in these images – loaded with silt and clay. Off to the left of the valley are the Pembina Hills, with a light covering of snow – white, centre-left in the image – and the Pembina River winding through them. 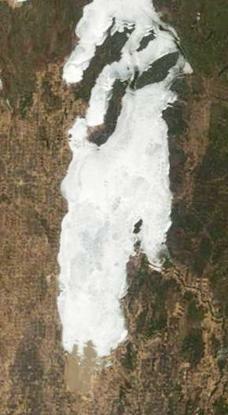 (And that’s Devil’s Lake – still ice-covered – in the south-west corner of the image.) The tan colour running up the centre of the darker fields marks the muddy flood waters of the Red River spreading out over the fields – several miles wide down near Fargo and Grand Forks. A little harder to see because of clouds is a broad flooded area further north, spreading east from the river, near Morris. 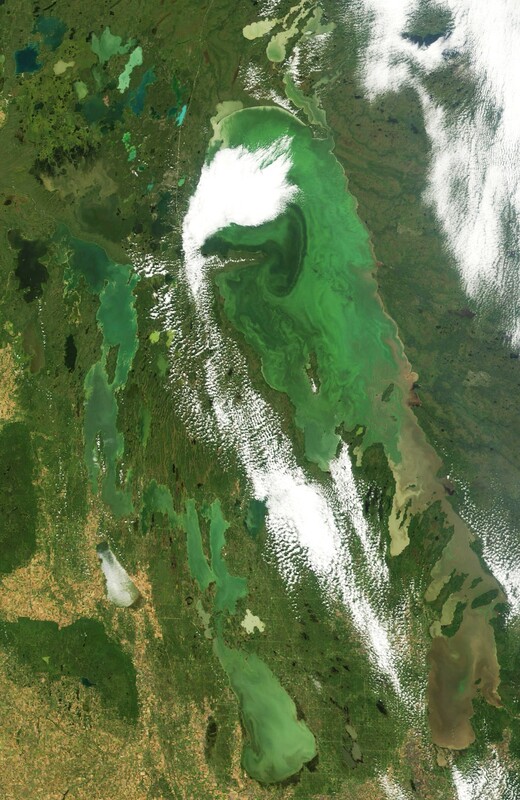 Over and above the damage the flood waters are doing along the river right now, we need to realize that they are picking up nutrients from the land – presaging yet another year of high nutrient loading into Lake Winnipeg. The image on the right – 17 April – shows the flood waters near their peak at Morris – the tan area a little above the centre of the image.